Body Worlds (Exhibition) tickets at The London Pavilion, London. 2018-2019. 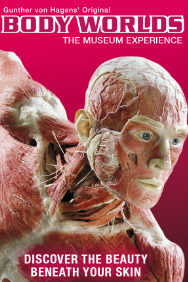 Find the best Exhibition - Body Worlds exhibition tickets at The London Pavilion, Inner London. Discover the beauty beneath your skin at the brand-new and interactive BODY WORLDS London Museum Experience. The original display of real human bodies finally has a permanent home in the heart of the city at the iconic London Pavilion. Dr Gunther von Hagens' renowned exhibition of real human bodies have sparked curiosity and awe around the world with over 47 million visitors globally. Over 200 anatomical specimens reveal the magic and mysteries that lie underneath the skin using a wide-range insights into our body and mind which show the effect lifestyle choices have on our health. Friday, 12th October 2018 to Tuesday, 30th April 2019.